Debutant director Punit Malhotra, nephew of ace designer Manish Malhotra is all set to rock the world of cinema with 'I Hate Luv Storys', which is slated for release on July 2. A young, romantic comedy with a fresh pairing of Imran Khan and Sonam Kapoor who epitomise today's youth, the film is about a teenage guy who hates the mushiness associated with young romance, and how he eventually falls into the magical trap of love. The team of 'I Hate Luv Storys' is leaving no stones unturned to promote the film, and ever since the promotion of the film began, there has been excellent feedback on the youthful energy and on-screen chemistry Imran and Sonam exhibit. Will the fresh pairing of Imran Khan and Sonam Kapoor in the small-budget film 'I Hate Luv Storys' lure the audience to cinema houses? Ganesha finds out. Mercury is in it's own sign in the 11th House of gains, but Ascendant Lord Sun and 2nd plus 11th House Lord Mercury are afflicted by Ketu. Moon is placed in the seventh House in water bearer's sign. Jupiter aspects the second House by Saturn is posited in the second House. Ganesha feels that the film may have an above start at the box office, but with the help of mouth publicity it may do good business till the first weekend. 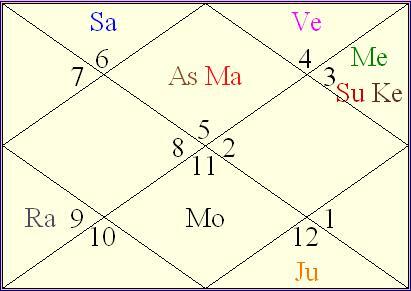 Despite this, it may not churn a lot because 2nd House and 11th House Lord Mercury is afflicted. In such case, if the film is released with more prints across India and abroad, the first week business may help producers gather a good sum, but this movie may not have any 'Midas touch' to keep the audience interested for a long time. Some of the dialogues may be good. Mercury is in it's own sign, so this may attract youngsters. However, it may not appeal all age groups. This film may end up doing average business in India, but in foreign land it might do well, predicts Ganesha. Good luck and may Lord Ganesha bless the cast and crew of 'I Hate LUV Storys'.